Relaxing in the shade before dinner. 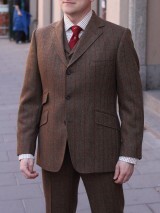 Fredrik in a blue summer kid mohair suit from Bladen. Relaxing in the shade before dinner. Karl Oskar in a Prince of Wales jacket and slim fit trousers from Magee. A usually dark navy single or double breasted jacket with brass or horn buttons.